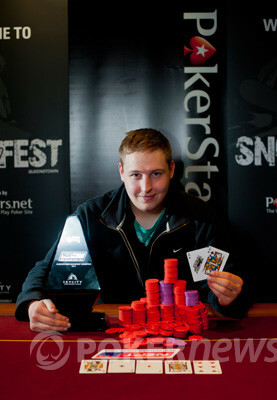 The 2011 PokerStars.net APPT Queenstown Main Event has finally come to its gripping conclusion, with the newest Asia Pacific Poker Tour champion finally crowned. It took almost 12 hours of tough play at the final table, including just under four hours of grueling heads-up action, but when all was said and done the NZD$94,300 was heading to Germany in the welcoming hands of Marcel Schreiner. When play kicked off earlier today it really was hard to predict who would go all the way, with some of the finest players in the region taking their seats at the table. It took an hour to lose our first player and it was 2010 APPT Sydney Grand Final Champion, Jonathan Karamalikis, who went home in 9th place. By the time another six players had made their way to the rail we were finally down to two, with 34 year old New Zealand local, Matt Yates the player going toe-to-toe against Marcel Schreiner. 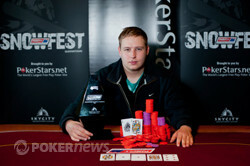 The heads-up battle lasted over 180 hands and for the majority of those it was Marcel Schreiner who held the chip lead. The exception to this was when the biggest hand of the night occurred when the players got all their chips in the middle on a board showing . Yates held against the , the higher kicker for Yates making all the difference as the river bricked out and a big chip lead was finally in the hands of Yates. The lead wouldn't last long though as Schreiner managed to chip away at Yates and slowly work his way back to a lead before managing to have Yates all-in holding against his own . When the flop hit the felt, the full house would have Yates drawing to only a chopped pot, but when the board bricked out, Yates was sent him home in second place, crowning our new champion! With the first ever APPT Queenstown champion crowned, the sentiment around the event is that it may be set to become one of the most popular on the tour, with not only a great poker event on offer, but with the beautiful city of Queenstown something to marvel at while away from the felt. A big congratulations must go out to all the final table finishers and especially to Marcel Schreiner, who goes home to Germany as an APPT champion and, of course, NZD$94,300 richer. Well folks, goodbye and thanks for joining the PokerNews Live Reporting Team, signing out from the APPT Queenstown Main Event! It was only a few hands after the break that Matt Yates would utter the words, "all in," and when Marcel Schreiner snap-called it would be a tournament life on the line. Yates was on the button when he moved all-in and as Schreiner called, the rail gathered around to see the players hands. Yates would need some help that would never come, with the devastating flop giving Schreiner the full house and leaving Yates' drawing to a chop that would never come. The 34 year old New Zealand local put in an amazing effort to get this far in the tournament and after almost 12 hours of solid play at the final table of the APPT Queenstown Main Event he will walk out of the SKYCITY Casino with his head held high and a cool NZD$60,000 for his effort. With a runner-up finisher in the books, we have our champion! The players are back from their break and ready to get to it. Could this be the level that a champion is finally crowned!? The two remaining players at the APPT Queenstown Main Event final table have been sent on another 10 minute break. Matt Yates has seen the last couple of pots pushed in the direction of his stack, with Yates now soaring above Marcel Schreiner. The first of the two pots saw Yates use relentless aggression to forces Schreiner out of the pot on the turn with a board showing . The very next hand saw Yates win a pot at showdown, holding on a board. 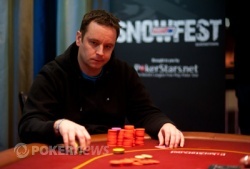 Schreiner sent his hand to the muck after calling a 135,000 chip bet from Yates. Matt Yates is again getting his stack close to the million-chip mark. Yates managed to take down a pot, holding on a board showing against the of Marcel Schreiner with Yates sucking a few chips out of Schreiner's busted up and down straight draw. There is a sense of deja vu at the final table with the chip stacks and play seeming eerily similar to that of over an hour ago. Matt Yates managed to gain alot of chips back, but again he sits behind a stack of around 800,000 after yet again having his stack chipped away at by Marcel Schreiner. The play was started when Matt Yates called from the button and Marcel Schreiner checked his option. The flop saw Yates bet 65,000 when checked to by Schreiner. A call from Schreiner would see a on the turn and a couple of checks from the two players. The on the river would see Schreiner take the lead, throwing out 125,000. When Yates made the call he would muck his hand as Schriener turned over for three-jacks.